Green Ox Pallet Technology is a two-piece corrugated pallet that allows for cost savings and efficiencies in the handling, storage, and transportation of products. Our technology helps companies overcome many of the supply chain challenges that affect their performance, both operationally and economically. In addition, our pallets provide sustainability benefits by helping companies reduce their overall environmental footprint. What makes Green Ox pallets different than other standard pallet options? 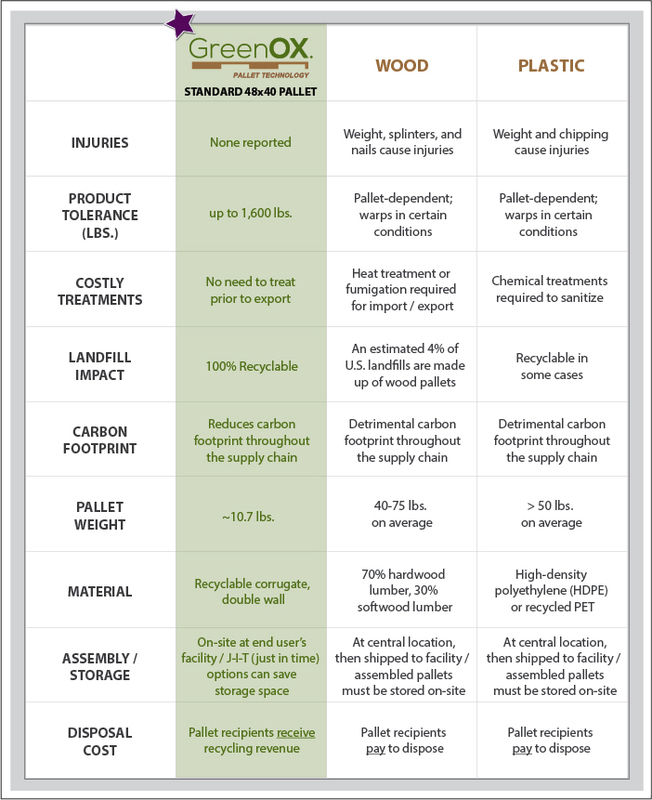 Please reference the chart below for key differences between Green Ox Pallet Technology (standard 48×40 pallet) and other pallet options. Recommended load weights are evaluated on a case-by-case basis based on load weight/distribution, load configuration, shipment type, unitization, and pallet use. No, unlike wood pallets that can harbor insects, bacteria, and animal waste, Green Ox pallets are 100% sterile when produced and require no treatment for import / export. Our pallets are also ISPM-15 exempt.